History: (Soviet Super-Soldiers#1) - Firefox led Russian military forces to hunt down the mutant underground forces led by Blind Faith, and quickly decimated the Underground Mutant Safe-System. He found one of their safehouses in a farmhouse in the Ukraine, and while it did not lead to Blind Faith, he killed all of the mutants there anyway. Blind Faith and his allies sought out the Underground Mutant Safe-System on the Black Sea. Blind Faith noted that the safehouse system had been co-opted, and that it would only be a matter of time before their safehouse was located. Blind Faith and his friends were determined to fight back. Sibercat and Stencil remained at the safehouse while the rest of their team was out, when the safehouse was located by Firefox and the military. 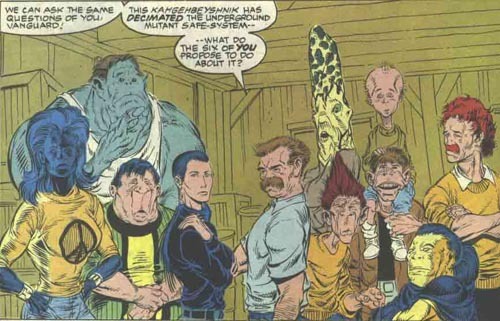 One of the mutants opened the doors to surrender to them, and Firefox filled the safehouse with bullets. All of the mutants inside were killed, except for Sibercat and Stencil.